It’s hard to understate the health benefits that can be imparted by eating blueberries. Previous reports have shown that they can help prevent cell damage linked to cancer, reduce inflammation in the body, and stave off problems associated with diseases like cardiovascular disease, metabolic syndrome, heart disease, and diabetes. Now, a study shows that they can also improve brain function in older adults. Researchers from the University of Exeter had older consumers drink concentrated blueberry juice and observed how it affected their physical health. They found that the concoction increased blood flow to the brain and improved overall cognitive function. "In this study, we have shown that with just 12 weeks of consuming 30ml of concentrated blueberry juice every day, brain blood flow, brain activation and some aspects of working memory were improved in this group of healthy older adults," said Dr. Joanna Bowtell. The study used 26 healthy participants between the ages of 65 and 77. Twelve were asked to consume the equivalent of roughly 230 grams of blueberries every day, while the remaining members were given a placebo. After a 12-week period, the researchers examined specific brain areas of each participant and found that those who drank the blueberry juice had increased brain activity. The researchers state that the findings corroborate past studies which show that plant-based foods can increase brain function. This is important, they say, because of the tendency for older consumers to experience cognitive decline. 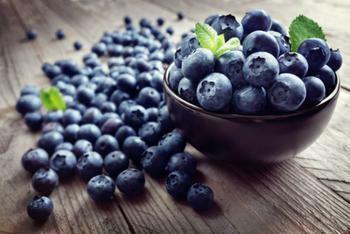 They suspect the positive effect of blueberries is derived primarily from their flavonoids, which are most closely linked to antioxidant and anti-inflammatory health benefits. The full study has been published in Applied Physiology, Nutrition, and Metabolism.